Options: Please Choose OneSetWrap only (-$34.00) Total =$44.00Towel only (-$40.00) Total=$38.00 Monogram, Single Initial or Name: Font Type: Please Choose OneNoneDiamond Initials(monogram)Script Initials (monogram)FishTail Initials (monogram) Block Initials (monogram)Block NameScript Name Thread Color: Please Choose OneNoneWhiteMatch Trim Ribbon Options: NoneFlamingo StripeWestbrook StripeFreemont StripeCappucino StripeGarden GateWhite w/Multi DotLime Green DotHot Pink DotTurquoise DotLt. Pink DotLt. Blue DotLavendar DotTaupe DotBlack DotRed DotYellow DotRoyal DotOrange Dot Who is this item for? 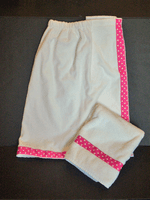 This wonderful 100% cotton terry wrap and towel set make a terrific gift! Please notice the discount if you purchase the set. Personalize it with a monogram, single initial or name and it is wonderful for the college bound young lady, a day at the spa or the country club enthusiast!!! Please be sure to complete the "who is it for?" section. Both pieces in a set must have the same personalization. The bath wraps are 25" long and 35" across the top elasticized band with a velcro closure. The towel is 52" long x 26" wide. Tween Size, Women's Large and X Large Wrap also available. Please contact store for details. If the "who is it for" full name does not fit in the space allowed please spell it out completely in the comments section. Gift wrapping available. Please be sure to put your gift enclosure message on the checkout page.